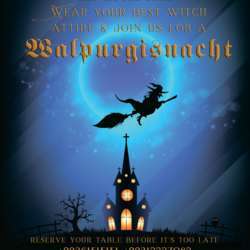 I am pleased to invite you to a Walpurgisnacht Party - the Night of Witches on Tuesday, 30 April from 20.00 at Yunus Art House Cafe. We will have a free make-up artist at the entrance to finish up your party look and transform you to a witch of your imagination. Fun night is guaranteed with a guest rock singer and a surprise dance performance. InterNations members will enjoy 20% discount on food and drinks. Please register your attendance here to claim as I’ll need to pass the final guest list to the restaurant.